Generation 2000 will be a collection of memories of ordinary people’s lives, those who have not experienced a collective event but those who live lives of personal importance. Generation is about all people from all backgrounds and all ages. Generation is about those of us who live in Ireland and who have something to give the next Generation. Reviews: RTE Radio, KCLR Radio, Evening Herald, Sunday Tribune. 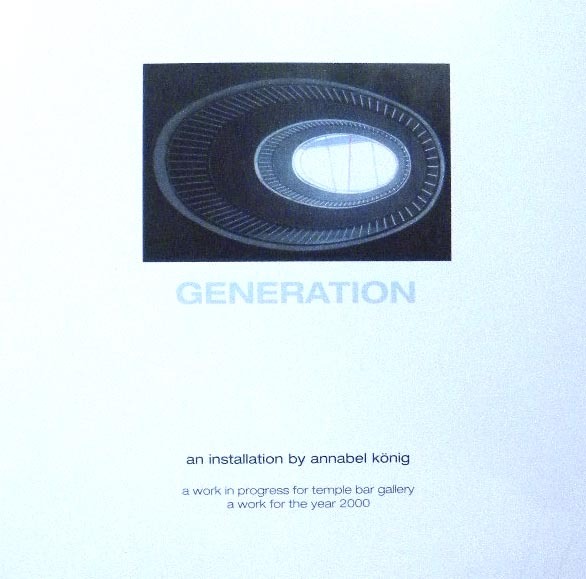 Generation is a work about the lives of many through the years. It explores the idea of memories and how these are often the things which shape us. The project ‘Generation 2000’, on it’s completion, will feature the memories of 2000 people, will project the images of 2000 people and celebrate the advent of the year 2000. The idea of Generation is that it will record 2000 short moments/memories of 2000 individual lives. Each person will relate and instance in their lives which is of importance to them. It can be a dramatic moment, told in a sentence or an event in one’s life relayed in one minute. Memory is a fickle thing, sometimes it becomes a little vague and patchy, sometimes it changes reality, leading us often to remember the past with a dream like quality. Each oral contributor will donate an image, of either themselves or an image relating to the memory. If they cannot locate an appropriate image, one will be chosen by me as my interpretation of their memory. These will be shown at random so the voice may, per chance, but probably not, correspond with the image. We image a person’s looks by their voice but are often incorrect about their physical presence when confronted by the voice and body. The contributors to the work will be a wide cross section of people. those I know, those who I vaguely know and people other people know. 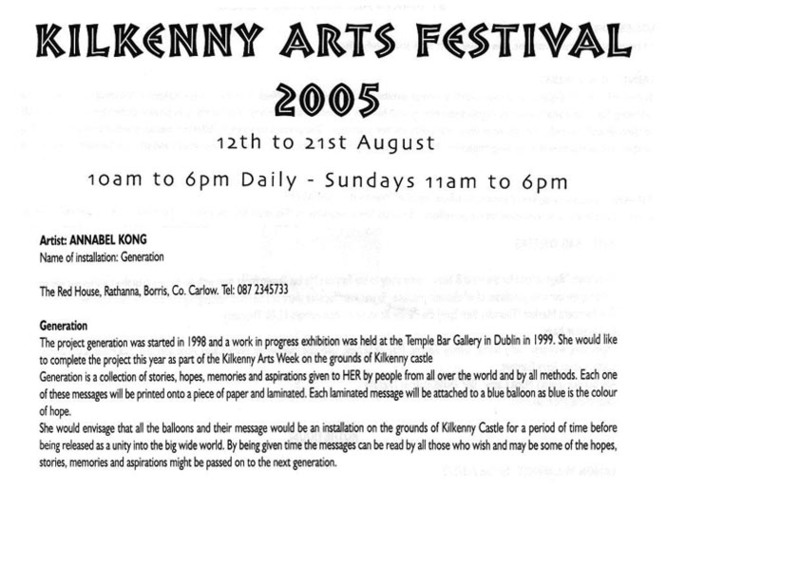 2000 years and 2000 people, the world is a small place, in Ireland everyone knows someone who knows someone you know. “I remember facing the world when I first visited “Ice to Water, Water to Words” (Annabel Konig 1994). The drip, drip of a melting body made of ice; red masks mounted on broken glass pyramids; perfectly crafted vessels of straw, clay and wax; life’s cycle in a huge video collage. Within a small private house personal memories ad public responsibilities were invoked. 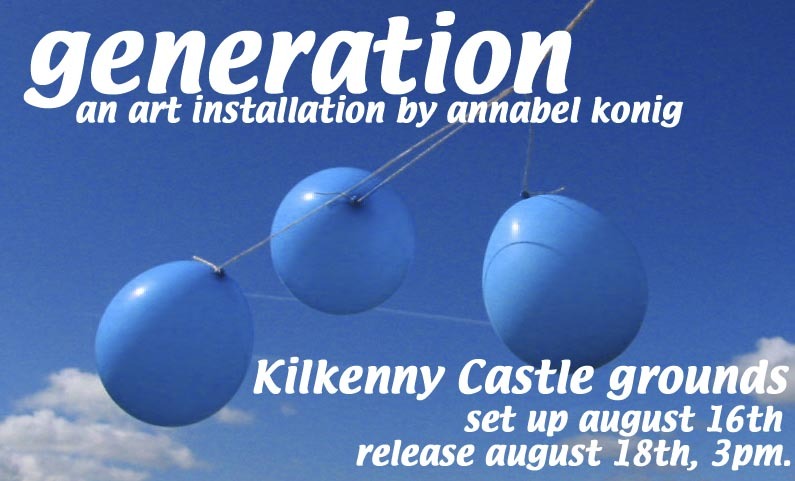 Now in creating ‘Generation’, Annabel Konig is recording stories of love, pain, jealousy, happiness…all the emotions that inform the eternal conversation. The details may change with time, but the primary emotions remain ever part of this continuum. Listening to the recordings and looking at the images, we are reminded of moment in our own lives: one story leads to another, and under each bubbling the essential truths.